The Performance Space is a community space that hosts a wide variety of performing arts, regular community events, and independent films. It is the ideal venue for live music, comedy, poetry slams, and small theater and dance performances. The room is intimate, inviting, and perfectly acoustically tuned. With its rosewood, pumice packed stage, deep red and black décor, full size movie screen and premium HD projector, it’s also a premier setting for conferences, private parties, lectures and events. Located just 15 minutes from downtown Santa Fe, The Performance Space has ample parking and is conveniently nestled inside La Plancha de Eldorado, one of Santa Fe’s best restaurants. No single promoter or organization is responsibile for programming. Instead, this dynamic venue is used by everyone. 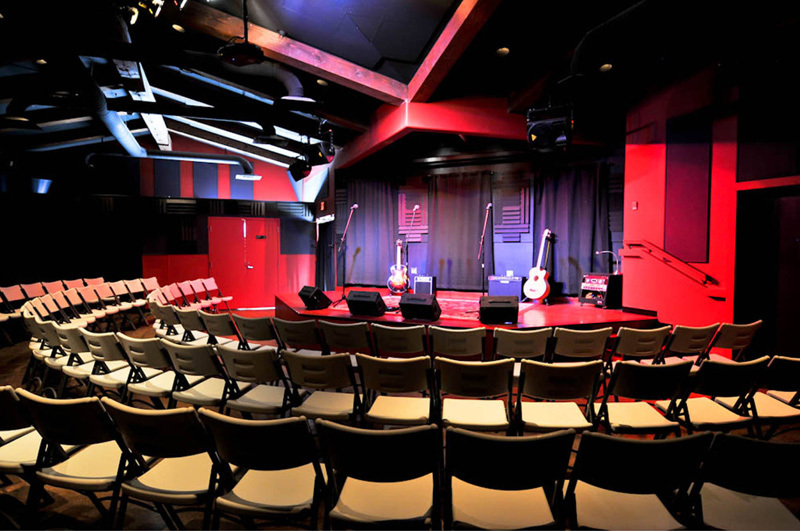 The Performance Space is available on a first come, first serve basis to groups and individuals, non-profits and corporations who share a vision of community, a passion for the performing arts, and a desire to hold events in the best sounding room in town.